Throughout this year our goal has been to give you guys tools and methods, which help discuss conflicts openly. One of these tools is a book about conflict and resolution. Below is an excerpt of the preface and after reading this we hope that you will want to download the book or order a free hardcopy from the CISV Norway office. ‘Conflict’ is a very complex word. Although the concept might seem very broad, complex, discouraging and intangible, analysing it provides us with the possibility to learn, so that we are able to make a change for the better. During our work on the theme ‘Conflict and Resolution’ we have done a lot of activities in which we often started off by finding out what people associate with the word ‘conflict’. The answers usually had negative connotations, such as ‘disagreement’, ‘violence’ and ‘hatred’. People generally do not realise that conflicts also carry positive outcomes; if handled correctly they can lead to innovation, development and stronger relationships. 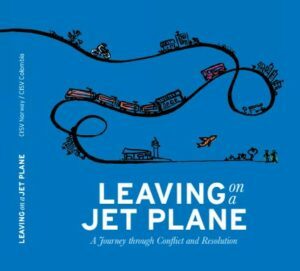 In Leaving on a Jet Plane – A Journey through Conflict and Resolution we will take you on a journey through the world of ‘Conflict and Resolution’. Together we will visit a lot of different destinations where you will get to know various perspectives, tools, and histories regarding different levels of conflict. On our adventure you will also be introduced to interesting people through some amazing stories, interviews and testimonies. You might experience a little bit of turbulence during some parts of this journey – as some articles are more complex than others – so take your time, because in the end we will always reach our destination, learning a lot while getting there. The book is divided into five different chapters that lead you through this exciting journey. You can choose to visit one destination at a time, or you can take the whole round trip. On our first stop we will introduce the conflicts closest to us; the kind of conflicts that we have with other people (Chapter 1). Then we venture out on deeper water, to explore the kind of conflicts that affect our local communities (Chapter 2). In the next part of our journey the ride starts to get bumpy. Here we get the chance to take a step further and investigate conflicts on a national scale (Chapter 3). After a little rest we continue by taking a look at different aspects of Conflict and Resolution at an international level (Chapter 4). Our journey then reaches our final destination of this trip, wrapping up by investigating the connections between the different levels of conflict and how we as CISVers can become sources of peace (Chapter 5). ‘Conflict and Resolution’ is a very big theme, and there is so much more to explore than what we were able to do within this project. With this book we offer you some insights into this field, and provide you with some stepping-stones to the subject. We hope that you will return from this journey with a lot of new attitudes, skills and knowledge, looking at conflicts in a different light, so that you will be better able to ‘be the change you wish to see’! Fasten your seatbelts and enjoy the journey!